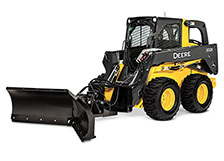 Worksite Pro™ snow/utility V-blades provide multifunction versatility for snow removal and light dirt work. With four angle positions, you'll be ready for whatever the jobsite brings: straight for larger cuts, V-configuration for pushing through hard pack, scoop (both sides inward) for easy snow stacking, and 30 degrees right or left. The BV6 V-blades are optimized to work with John Deere 313/315 Skid Steers. They're also compatible with many competitive models. See your local Deere dealer for details.